The inDemand co-creation model is now under implementation in the Paris region. The first step has started: since Monday 8th and until Friday 26th January 2018, the Call for Challenges is open and the pilot hospitals involved in the 1st iteration can submit their actual needs for digital innovative solutions. For this first implementation of the model, GIP Resah has involved two big hospitals of the Paris region: the CHI Créteil and the CH Foch. The healthcare organisations have a strong innovation policy and wishes to actively participate in such initiatives to accelerate the dissemination of innovative solutions in the healthcare sector. Prior to the launching of the Call for Challenges, the top management of both hospitals have identified the collaborators (physicians, nurse, head of the IT department…) who are the most suitable to identify and define the actual needs (Challenges) of their hospitals that can potentially be addressed by a new eHealth solution. These identified persons are called “Intrapreneurs” within the inDemand model and are the ones who have been invited to participate to the closed Call for Challenges. Following the selection of the most relevant Challenges, Paris Région Entreprise, with the role of Funder in the project, will launch a public Call for Solvers toward innovative European start-ups and SMEs in March 2018. One company will be selected per Challenge to work closely with the hospitals to finalise the development of their eHealth solution. “Hospital Foch has stated in its development strategy the objective to become a digital and innovative hospital with a strong participation in the digitalisation of the healthcare organisations. 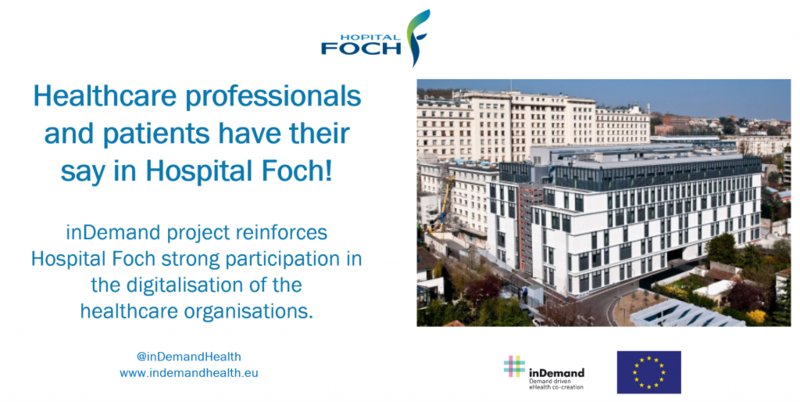 Knowing that it is a need expressed by the users/patients, the healthcare professionals but also the city, Foch hospital has the wish to use additional competences of its medicals professions to develop adapted tools to address these needs. Therefore, it’s naturally that the hospital has favourably responded for the participation in the inDemand project which will enable the achievement of part of its objectives. The creation of a link with companies adapted to the defined needs/challenges is a real added-value. The adaptation of the solutions with the identified needs via a co-creation mechanism seems to be the most adapted process to develop and adopt innovative digital solutions in the healthcare sector”.